We have a variety of bed assistants available to help getting in and out of bed. The Bed Cane from Stander, Inc. is a portable, foldable cane with a cushion grip. It features adjustable rail height that adapts to mattresses of various thicknesses, and can be installed on either side of the bed. 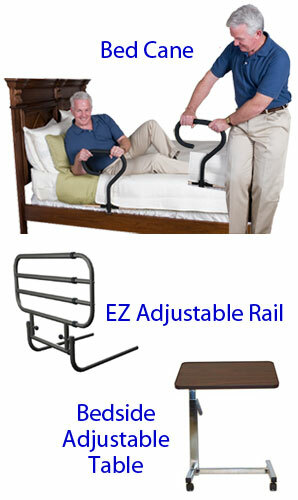 The EZ Adjustable Rail from Stander is a great alternative to full sized rails, adjusting to just the length you need, from 26″ to 34″ to 42″. It can assist with getting in and out of bed, or serve as a side rail to prevent falling out of bed. We have bedside tables that tilt and adjust in height, and can be moved out of the way when they’re not needed.